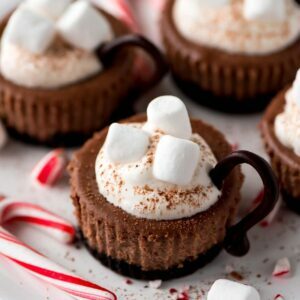 Cute and Delicious Hot Cocoa Cheesecake Minis - this simple and adorable treat has a creamy chocolate cheesecake center and is topped with whipped cream and marshmallows! Combine cookie crumbs and butter; press onto bottoms of 12 paper-lined muffin cups. Bake 8 min. Beat cream cheese, 1/2 cup sugar and 1/4 cup cocoa powder in medium bowl with mixer until blended. Add eggs, 1 at a time, mixing on low speed after each just until blended. Spoon over crusts. Bake 22 to 25 min. or until centers are almost set. Cool completely. Refrigerate 2 hours. Meanwhile, cover baking sheet with parchment. Melt semi-sweet chocolate as directed on package; spoon into resealable plastic bag. Cut small piece off one bottom corner of bag; use to squeeze chocolate into 12 shapes on prepared baking sheet to resemble cup handles as shown in photo. Freeze until ready to use. Remove liners from cheesecakes. Beat cream and remaining sugar in separate medium bowl with mixer on high speed until soft peaks form; spoon onto cheesecakes. Sprinkle with remaining cocoa powder; top with marshmallows (we even added crushed candy canes for an extra flair). Gently press chocolate handle into side of each cheesecake.